The igNumericEditor control accepts a wide array of numeric input. You can optionally choose to make spin buttons available on the editor. Further information regarding the classes, options, events, methods and themes of this API are available under the associated tabs above. The igNumericEditor control extends the functionality of the igEditor control. For more igNumericEditor API details, refer to the igEditor API documentation. The following code snippet demonstrates how to initialize the igNumericEditor control. Sets gets duration of animation in milliseconds when drop-down list is hidden. That option is not supported when "type" is set to "datepicker", because the jquery.ui.datepicker does not have similar feature. Default is 200. If value is less than 5, then animation is disabled. Sets gets duration of animation in milliseconds when drop-down list or calendar is displayed. Default is 200. If value is less than 5, then animation is disabled. Sets gets visibility of spin and drop-down button. That option can be set only on initialization. Combinations like 'dropdown,spin' or 'spinclear' are supported too. button to open list is located on the right side of input-field (or left side if base html element has direction:rtl);. button to clear value is located on the right side of input-field (or left side if base html element has direction:rtl);. spin buttons are located on the right side of input-field (or left side if base html element has direction:rtl). Sets gets type of value returned by the get of value() method. That also affects functionality of the set value(val) method and the copy/paste operations of browser. the String object is used with 'text' in display mode format. the String object is used with 'text' in edit mode format. the Number object is used with limits of double and if value is not set, then the null or Number.NaN is used depending on the option 'nullable'. Note: that is used as default. the Number object is used with limits of double and if value is not set, then the null or Number.NaN is used depending on the option 'nullable'. the Number object is used with limits of double and if value is not set, then the null or 0 is used depending on the option 'nullable'. the Number object is used with limits of signed long and if value is not set, then the null or 0 is used depending on the option 'nullable'. .
the Number object is used with limits of unsigned long and if value is not set, then the null or 0 is used depending on the option 'nullable'. the Number object is used with limits of signed int and if value is not set, then the null or 0 is used depending on the option 'nullable'. the Number object is used with limits of unsigned int and if value is not set, then the null or 0 is used depending on the option 'nullable'. the Number object is used with limits of signed short and if value is not set, then the null or 0 is used depending on the option 'nullable'. the Number object is used with limits of unsigned short and if value is not set, then the null or 0 is used depending on the option 'nullable'. the Number object is used with limits of signed byte and if value is not set, then the null or 0 is used depending on the option 'nullable'. the Number object is used with limits of unsigned byte and if value is not set, then the null or 0 is used depending on the option 'nullable'. Sets gets the character, which is used as decimal separator. Note: this option has priority over possible regional settings. Sets gets style.display for outer html element. The value of "" will disable changing style.display. because, some browsers may fail to handle display other than default value of browser. For example, if base element for editor is TD, then behavior in Chrome can be problematic. Sets gets ability to override the "readOnly" option and allow showing the drop-down list and changing the value in the editor from a list. Value false does not allow drop-down when "readOnly" is true. Sets gets list of actions which trigger display of drop-down list or calendar. The list should include flags separated by the "," character. Flags may include optional "ctrl+", "shift+" or "alt+" prefix. If prefix is defined, then action is triggered for combination of flag-action with Ctrl, Shift or Alt key. Down-arrow shows drop-down and up-arrow hides drop-down;. Any upper case characters show drop-down. If that option is disabled and the editor is not focused, then a mouse click on the spin button will keep the text in the editor in display (not focus) format and perform spin actions. (array of number objects) Sets gets the number of digits in integer part of number, which are divided into groups. The "numericGroupSeparator" is inserted between groups. If the sum of all values in array is smaller than the length of integer part, then the last item in array is used for all following groups. Count of groups starts from the decimal point (from right to left). That option has effect only in display (no focus) state. Sets gets the character, which is used as separator for groups (like thousands). Sets gets height of editor in pixels. Only positive values have effect. If that option is not set, then value of style.height of base html element will be used automatically. However, that value should be in the px units. Sets gets ability to hide the Enter key from browser. Gets sets name of (hidden) INPUT element, which value will be set to current value of editor on any change. Sets gets number of columns in drop-down list. Sets gets location of drop-down list. Value true will create html element for list as a child of main html element. Value false creates list as a child of body. That option has effect only for drop-down defined by listItems. The value of true is supported only when main (outer) html element of editor is container such as SPAN or DIV, or buttons are enabled, or renderInContainer is enabled, the theme is set. The value of true allows a better positioning and can be useful when editor is located in complex layout and containers with "position:fixed". Sets gets list of items which are used for drop-down list, spin, validation and auto-complete functionality. Items in list can be strings, numbers, dates or objects in any combination. If type of editor is date or datepicker and item is string, then igEditor will try to convert it to Date object and show item in display format. If type of editor is numeric, currency or percent and item is string, then igEditor will try to convert it to number and show item in display format. If item is object and it has member "text", then that member is used. If item is object and besides "text" has function getHtml(), then that function is used to render item in list. The item or item.text is used to set "value" of particular editor when list-item is selected. Sets gets maximum height of drop-down list in pixels. If value is equal to 0 or negative, then the height of list is defined by number of items in list. Sets gets custom width of drop-down list in pixels. If value is equal to 0 or negative, then the width of editor is used. Sets gets strings used for title of buttons. Value of object should contain pairs or key:value members. Note: any sub-option of locale can appear within the main option of igEditor. In this case those values within main options will have highest priority and override corresponding value in locale. Sets gets the maximum number of decimal places which are used in display (no focus) state. Sets gets maximum length of text which can be entered by user. Negative values or 0 disables that behavior. Sets gets the maximum value which can be entered in editor by end user. Sets gets the minimum number of decimal places which are used in display (no focus) state. If number of digits in fractional part of number is less than the value of this option, then the "0" characters are used to fill missing digits. Sets gets the minimum value which can be entered in editor by end user. Sets gets the pattern for negative numeric values, which is used in display (no focus) state. The "n" flag represents the value of number. The "-" and "()" flags are static part of pattern. negativePattern : "- &nbsp n"
Sets gets the character, which is used for negative numeric values. Sets gets ability to prevent null value. If that option is disabled, and editor has no value, then value is set to 0 (or minValue/maxValue). Sets gets text which appears in editor when editor has no focus and "value" in editor is null or empty string. Sets gets the representation of null value. Set gets ability to modify editor from keyboard (false) or disables keyboard (true). If the "spinOnReadOnly" is enabled, then value will be modified on spin regardless of the "readOnly". If the "listItems" has items and "dropDownTriggers" is defined, then value will be modified from drop-down list regardless of the "readOnly". Sets gets custom regional settings for editor. If it is string, then $.ig.regional[stringValue] is assumed. Sets gets option to wrap input field into SPAN..
That option can be set only on initialization and it is available only when base element is INPUT or TEXTAREA. If drop-down button or spin-buttons are enabled or the theme is set, then that option has no effect. The reason for that property is to allow vertical alignment of several igEditor controls when they are located in html inline and some of them have enabled buttons. If all editors are created within SPAN wrapper, then they will appear on the same line. Otherwise, editors in SPANs will be shifted 3-6 pixels above INPUT editors. Set gets validation for empty value in editor. Sets gets support for E-power format in edit mode. scientific format is enabled and the "E" character is used. scientific format is enabled and the "E" character is used. The "E+" is used for positive values in display mode. Sets gets behavior of selection/caret in input-field when editor gets focus. Set caret at the beginning of text. Set caret at the end of text. Use default behavior of browser (in case of mask, numeric and date editors it may be unreliable). Sets gets delta-value which is used to increment or decrement value in editor on spin events. Sets gets ability to override the "readOnly" option and allow changes "value" of editor on spin events. Value false does not allow spin when "readOnly" is true. Sets gets ability to automatically set value in editor to opposite limit, when spin action reached minimum or maximum limit. In case of listItems, the first and the last items in list are used as minimum and maximum values. Gets sets value in tabIndex for editor. Sets gets horizontal alignment of text in editor. If that option is not set, then 'right' is used for 'numeric', 'currency' and 'percent' editors and the 'left' is used for all other types of editor. Sets gets selector for css classes used by editor. That option allows replacing all default css styles of editor by custom values. Application should provide css classes for all members defined in the css options with "theme" selector. Note: changing theme is not supported when base element is INPUT or TEXTAREA and renderInContainer or button are not enabled. Sets type of editor. If that option is not set, but the 'value' option is defined, then if type of 'value' is Number, then the 'numeric' type is used, if type of 'value' is Date, then the 'date' type is used. For all other types of 'value' the 'text' type is used. Note: if that option is set to 'datepicker', then application should ensure that css and js files used by jquery.ui.datepicker are available. Text editor is created (same as 'text'). Mask editor is created (same as 'mask'). Date-time editor is created (same as 'date'). Date-picker is created (same as 'datepicker'). Numeric editor is created (same as 'numeric'). Currency editor is created (same as 'currency'). Percent editor is created (same as 'percent'). Sets gets options supported by igValidator. In order to enable validation and use defaults, an empty object can be used. Note: validation rules of igValidator, such as min, max, minLength, required are not supported, but similar properties of igEditor should be used. Gets sets value in editor. The effect of setting/getting that option depends on type of editor and on dataMode options. That can be string, number or Date depending on type of editor. If it is used on initialization and the type option is missing, then if 'value' is Number, then 'numeric' editor is created automatically and if 'value' is Date, then the 'date' editor is created. Sets gets width of editor in pixels. Only positive values have effect. 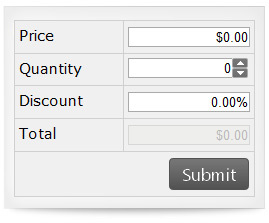 If that option is not set, then value of style.width of base html element will be used automatically. However, that value should be in the px units. Event which is raised when input field of editor loses focus. Use ui.owner to obtain reference to igEditor. Use evt.originalEvent to obtain reference to event of browser. Event which is raised when button was clicked by mouse. Event which is raised when input field of editor gets focus. Event which is raised before drop-down list or calendar is opened. Function takes argument evt and ui. Use ui.value to obtain reference to the selected item in list or Date in calendar. If ui.value is not null and not undefined, that it means that drop-down was closed due to selection from drop-down list or from calendar. Otherwise, drop-down was closed due to lost focus or Esc key press. Return false in order to cancel hide action and keep drop-down visible. It is not recommended to cancel that action on blur event. Note: In case of calendar of datepicker, the evt or evt.originalEvent can be null. That happens if calendar was closed on blur or by Esc key. Returning the false in this situation will not prevent closing drop-down calendar. Event which is raised on lost focus when editor contains invalid value. That event is available for all editors besides default "text" type editor. Use ui.value to obtain suggested value. Set ui.value to change suggested value. If type of editor is numeric, currency, percent, date or datepicker, then ui.text contains actual text entered by user. If type of editor is numeric, currency or percent, then the ui.reason may have following flags: "null", "format" or "limit". ui.milliseconds - milliseconds of entered date. //may have following flags: "null", "dayOfMonth", "numberOfFields", "limit", "invalid"
Event which is raised on keydown event. Return false in order to cancel key action. Use ui.key to obtain value of keyCode. Event which is raised on keypress event. Set ui.key to another character which will replace original entry. Event which is raised on keyup event. Event which is raised after list item was selected. Use ui.index to get new selected index. Use ui.oldIndex to get old selected index. Use ui.item to get reference to new selected item. Event which is raised before list item is selected. Return false in order to cancel select action. Event which is raised on mousedown at any part of editor including drop-down list. Use ui.elementType to obtain type of html element under mouse, such as field, button, spinUpper, spinLower or item#. Use ui.id and ui.elementType to obtain flag which represents html element under mouse. //obtains type of html element under mouse, such as field, button, spinUpper, spinLower or item#. //obtains id of html element under mouse, such as field, button, spinUpper, spinLower or item#. Event which is raised on mouseleave at any part of editor including drop-down list. Event which is raised on mousemove at any part of editor including drop-down list. Event which is raised on mouseover at any part of editor including drop-down list. Event which is raised on mouseup at any part of editor including drop-down list. Return false in order to cancel drop-down action. Event which is raised on spin event. Return false in order to cancel spin. Use ui.delta to obtain delta for increment or decrement. Use ui.value to obtain the "value" of editor before spin action. Event which is raised after text in editor was changed. Use ui.value to obtain new value and ui.oldValue to obtain old value. Event which is raised after value in editor was changed. It can be raised on lost focus or on spin events. Event which is raised before value in editor was changed. Return false in order to cancel change. It can be raised on lost focus or on spin events. Returns reference to this igEditor. Item for list. It can be string, number or Date object. Index within current list where item is inserted. If parameter is missing or too large or negative, then item is appended to list. Adds several items to list. Index within current list where items are inserted. If parameter is missing or too large or negative, then items are appended to list. Removes all items from list. Destroys editor and return base element back to its pre-init state. Gets reference to jquery object which is used as container of drop-down. returnType="$" Returns reference to jquery object or null. That can be container of list items or in case of igDatePicker it can be calendar of jquery.datepicker. Gets sets visibility of drop-down list. returnType="bool|object" If parameter is defined, then returns reference to this igCombo, otherwise, returns true if drop down is visible and false if drop down is hidden. Value true will show dropdown, false - hide dropdown. .
Gets reference to jquery object which is used as edit field. returnType="$" Returns reference to jquery object. That can be INPUT or TEXTAREA. Returns index of item or -1. Finds index of list item by text. Value true sets request to ignore case. Value true will perform partial search rather than full match. Value true will perform search anywhere within text of item, otherwise starts-with search is used. Returns value of option used by editor. Gets calculated value of regional option used by numeric and date editors. Name of regional option, such as "monthNames", "dateLongPattern", "currencySymbol", etc. Gets reference to selected item in list. returnType="string|number|date|object" Returns reference to selected item or null. Gets selected text in editor. Position of left or right edge of selection. Gets left or right edge of selection. That method can be used only when editor has focus. If true then left edge of selection is returned. Otherwise, right edge selection is returned. Get value in editor by dataMode. returnType="string|number|date|object" Returns value in editor or null. The value of dataMode option supported by editor. It can be string or number. For example, in case of numeric editors that can be a number in range from -1 to 11, or string such as "text", "double", "byte", etc. Returns true if editor has focus. Checks if editor has focus. Returns true if message is displayed. Checks if invalid message is displayed. Returns true if value is valid, false - value is invalid. Checks if value in editor is value. Note: that method may fail if editor has focus (in edit mode). Gets reference to jquery object which is used as top/outer element of igEditor. returnType="$" Returns reference to jquery object. Paste text at location of caret. Note: method raises the "textChanged" event. Removes editor from its parent element, but keeps the rest of functionality. Current item in list. It can be string, number or Date object. Removes item from list at index. Index of item. If it is negative number, then last item in list is removed. Selects text in editor. If parameters are equal, then than method sets location of caret. That method has effect only when editor has focus. Left edge of selection. If parameter is missing, then all text is selected. Right edge of selection. If parameter is missing, then value of first parameter is used. Internal use only (new text). Returns index of selected item if parameter is undefined. Gets sets selected index of list item. Set focus to editor with delay. Delay in milliseconds. If parameter is missing, then 0 is used. If parameter is -1, then focus is set without delay. Shows editor (if it was hidden). Increments of decrements value in editor according to the parameter. If editor has listItems, then that method increments or decrements selected index in list and sets value in editor to new selected item. In this case if delta is positive, then list selected index in incremented by 1 and if delta is negative then selected index is decremented by 1. Value to increment or decrement current value in editor. Gets sets text in editor. returnType="string|object" Returns text in editor if parameter is undefined. Otherwise, it returns reference to this igEditor. Returns true if value is valid, false - if value is invalid and error message was displayed. Triggers validation of editor and show error message. That method has effect only when validation is enabled. Value of true will allow to skip error message if validation failed. Returns reference to igValidator or null. Gets reference to igValidator used by igEditor. Gets sets value in editor. returnType="string|number|date|object" Returns value in editor if parameter is undefined. Otherwise, it returns reference to this igEditor. New value for editor. It can be string, number or Date object. Class applied to the SPAN element which represents button. Default value is 'ui-igedit-button'. Class applied to the SPAN element which represents clear button. Default value is 'ui-igedit-buttonclear'. Class applied to the SPAN element which represents image on clear button. Default value is 'ui-igedit-buttonimage ui-icon-circle-close ui-icon'. Classes applied to the the SPAN element of button in default state (no focus, no mouse, no press). Default value is 'ui-igedit-buttondefault ui-state-default'. Classes applied to the SPAN element of button in disabled state. Default value is 'ui-igedit-buttondisabled ui-state-disabled'. Classes applied to the SPAN element of button when editor has focus. Default value is 'ui-igedit-buttonfocus'. Classes applied to the SPAN element of button in mouse-over state. Default value is 'ui-igedit-buttonhover ui-state-hover'. Classes applied to the SPAN element which represents image on dropdown/clear button. Default value is 'ui-igedit-buttonimage ui-icon-triangle-1-s ui-icon'. Class applied to the SPAN element which represents image on button in disabled state. Default value is 'ui-igedit-buttonimagedisabled'. Class applied to the SPAN element which represents image on button in mouse-over state. Default value is 'ui-igedit-buttonimagehover'. Class applied to the SPAN element which represents image on button in pressed state. Default value is 'ui-igedit-buttonimagepressed'. Classes applied to the SPAN element of button in pressed state. Default value is 'ui-igedit-buttonpressed ui-state-highlight'. Class applied to the SPAN element which represents button when direction is rtl. Default value is 'ui-igedit-button-rtl'. Class applied to the images of buttons when editor has focus or mouse-over, but mouse-over does not belong to a particular button. Default value is 'ui-igedit-buttonsimagestateoverride'. Class applied to the top element when editor is rendered in container. Default value is 'ui-igedit-container'. Classes applied to the editing element in disabled state. Default value is 'ui-igedit-disabled ui-state-disabled'. Class applied to the drop-down element which contains list of items or datepicker-calendar. Default value is 'ui-igedit-dropdown'. Class applied to the main/top element. Default value is 'ui-igedit ui-state-default ui-widget ui-corner-all'. Class applied to the editing element. Default value is 'ui-igedit-field'. Class applied to the field when direction is rtl. Default value is 'ui-igedit-rtl'. Class applied to the editing element in focus state. Default value is 'ui-igedit-focus ui-state-focus'. Class applied to the editing element in mouse-over state. Default value is 'ui-igedit-hover ui-state-hover'. Class applied to the DIV element which is used as container for dropdown list. Default value is 'ui-igedit-list ui-widget ui-widget-content ui-corner-all'. Class applied to the SPAN element which represents item in dropdown list. Default value is 'ui-igedit-listitem ui-state-default'. Class applied to the SPAN elements located in columns on the right in dropdown list. That has effect only when multiple columns in list are enabled. Default value is 'ui-igedit-listitemcolumnborder'. Class applied to the Class applied to the SPAN element which represents item in dropdown list with mouse-over state. Default value is 'ui-igedit-listitemhover ui-state-hover'. Class applied to the Class applied to the SPAN element which represents selected item in dropdown list. Default value is 'ui-igedit-listitemselected ui-state-highlight'. Class applied to the editing element of numeric editor when value is negative. Default value is 'ui-igedit-negative'. Class applied to the main element when list is below editor and to list when list is above editor. Default value is 'ui-igedit-no-bottom-corners'. Class applied to the main element when list is above editor and to list when list is below editor. Default value is 'ui-igedit-no-top-corners'. Class applied to the editing element when it has no value. Default value is 'ui-igedit-nullvalue'. Class applied to the SPAN element which represents spin button. Default value is 'ui-igedit-spinbutton'. Class applied to the SPAN element which represents image on spin button. Default value is 'ui-igedit-spinbuttonimage ui-igedit-spinbuttonimage'. Class applied to the SPAN element which represents image on lower spin button. Default value is 'ui-igedit-spinlowerimage ui-icon-carat-1-s ui-icon'. Class applied to the SPAN element which represents image on lower spin button in disabled state. Default value is 'ui-igedit-spinlowerimagedisabled'. Class applied to the SPAN element which represents image on lower spin button in mouse-over state. Default value is 'ui-igedit-spinlowerimagehover'. Class applied to the SPAN element which represents image on lower spin button in pressed state. Default value is 'ui-igedit-spinlowerimagepressed'. Class applied to the SPAN element which represents image on upper spin button. Default value is 'ui-igedit-spinupperimage ui-icon-carat-1-n ui-icon'. Class applied to the SPAN element which represents image on upper spin button in disabled state. Default value is 'ui-igedit-spinupperimagedisabled'. Class applied to the SPAN element which represents image on upper spin button in mouse-over state. Default value is 'ui-igedit-spinupperimagehover'. Class applied to the SPAN element which represents image on upper spin button in pressed state. Default value is 'ui-igedit-spinupperimagepressed'. Class applied to the TEXTAREA element. Default value is 'ui-igedit-textarea'.